"You!" The pistol was now pointing straight at Nell, but instead of shrinking away, or making hast (as Letty quaveringly implored her to do) to strip off her bracelets and rings and the large pendant that flashed on her breast, she was sitting bolt upright, her incredulous gaze fixed at first on the hand that grasped the pistol, and then lifting to the masked face. "Hell and the devil confound it!" ejaculated his lordship, adding,however, in a hasty attempt to cover this lapse: "None o' that! Hand over the gewgaws!" "Well, I don't know how the devil she should!" said the Viscount,considerably put-out. "Oh, Dy, how absurd you are!" Nell exclaimed, trying not to laugh. "The moonlight was shining on the ring Mama gave you when you came of age! And then you said Not you! to Letty! Of course I recognised you!" One genre I didn't mention last week is the Regency Romance period which flourished between 1811 to 1820's during the shift from the aristocratic Age of Enlightenment to the artistic movement of Romanticism. Since the period overlapped the Napoleonic wars, writers expanded on themes of the drama of wounded soldiers, mystery, adventure and of course, romance. Regency romances are light and fluffy reads and since most are set in England, hence the term Flufferton Abbey. The queen of the Regency Romance is undoubtedly Georgette Heyer. Although Jane Austen lived and wrote her books during the 1800's, Heyer created the Regency England genre of romance novels. Back when I was a teen in the 70's, Harlequin romances and historical romances were my favorite reads and I actually still have a few in my shelves, all yellowed and well read. Authors to check out, besides Jane Austen and Georgette Heyer, are Julie Quinn, Mary Balogh, and Loretta Chase to name a few. Be sure to peruse Goodreads list of Popular Regency books. And we can't forget the classic authors whose best known works were written during the Regency period: Percy Bysshe Shelley and Sir Walter Scott as well as poets Lord Byron, William Blake and John Keats. Join me in flufferton abbey this month and read a book from the regency era. 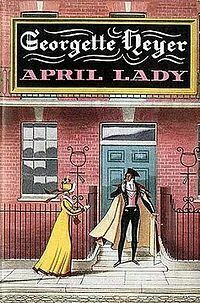 Dare I admit that I have never read a Georgette Heyer novel before? I started one this week and it's delightful! Thanks for the push to read something I should have read long ago!